This article is about the playable character in the LEGO Star Wars video games. For other uses of the term, see Ewok (disambiguation). An Ewok is a Star Wars character, based upon the species of the same name. 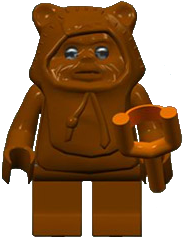 Ewoks are also playable characters in the video games LEGO Star Wars II: The Original Trilogy, LEGO Star Wars: The Complete Saga and LEGO Star Wars III: The Clone Wars. In the former two, the character is armed with a slingshot, and is able to crawl through small vents. Ewoks are small furry creatures that live on the forest moon of Endor. They mistook C-3PO as the "golden one", one of their many gods which had yet to appear in physical form and took Han Solo,Luke Skywalker,Chewbacca and R2-D2 captive. While the Ewoks where preparing a banquet in Threepio's honor,he said to let them go or he would use his "magical powers",though the Ewoks didn't listen,Luke used the force to move him in the air so that the Ewoks would get scared for that. Later that day,C-3PO told the Ewoks why they are here,what happened before,and what could happen next. Then the Ewoks and the Rebellion made peace,and thus the Ewoks aided the Rebels in defeating the Empire,which was succesful.